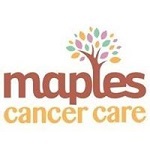 Maples Cancer Care (working name of Rotherham Cancer Care Centre) provides free care and support to Rotherham people who have had a diagnosis of cancer and also to their main carer. We provide complementary therapies and/or counselling but most of all we help people to cope and improve the quality of their life. Our highly trained and experienced staff understand the effects of cancer on people’s lives and we are used to working with people at all stages of illness. We aim to support the people who come to the Centre by providing services that complement the specialised care they will receive from the NHS. The Centre is open Tuesday, Wednesday & Thursday.